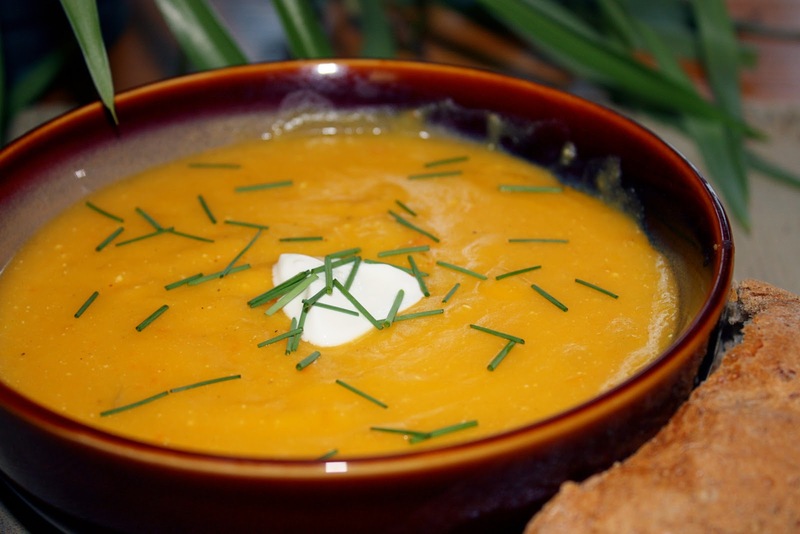 Warm, creamy and saturated with fall flavor, this soup is great with some warm, crusty bread. 1.Melt butter in a large pot over medium heat. Stir in leeks and onions, and cook until the onion softens and turns translucent, about 5 minutes. Add potato, squash, carrots, apple, and chicken stock. Bring to a boil, then reduce heat to medium-low, cover, and simmer until the vegetables are soft, about 20 minutes. 2.Carefully puree the soup in batches in a blender, or use a stick blender to puree the soup right in the pot. Once the soup has been pureed, return it to the pot and stir in wine and cream. Season with nutmeg, salt, and pepper; simmer gently for 5 minutes. Ladle into bowls and garnish with chopped chives.